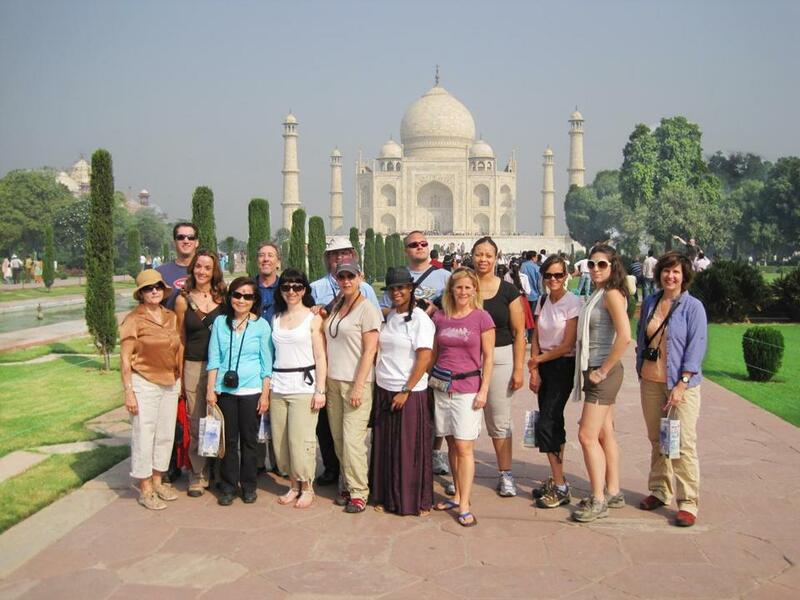 Global Expeditions Club travelers during their visit to India. Growing up in rural New York State, Cherity Berryann didn’t travel much with her family. Her mother was afraid to fly. As an adult, she has been making up for lost time. In recent years, Berryann, a Stoneham resident who is single and in her 40s, has traveled to Thailand and Croatia, camped in Peru and experienced Oktoberfest in Germany. She’s even been to Antarctica. Now, she’s considering the whole megillah: a trip around the world. Until recently, she says, that wouldn’t have been an option. The expense was prohibitive, and the prospect of booking all those accommodations and connecting flights just seemed too daunting. So she was thrilled when Kevin Foley and Jeff Kelly, the two local entrepreneurs behind the adventure travel group Global Expeditions Club, recently announced the first in a proposed series of round-the-world tour packages. Next September, the club will conduct the first of what it hopes to be many trips: a three-week, six-country journey spanning London, Paris, Dubai, and Hong Kong, with stops along the way to see the Taj Mahal and the Great Wall of China. At a base cost of less than $5,000, it seems almost to good to be true to Berryann. “It’s definitely a once-in-a-lifetime opportunity,” she says. But Foley and Kelly intend to make the dream of traversing the globe far more accessible than it’s ever been. Both veteran world travelers, they have pooled their experience to build an impressive, fully guided itinerary at an affordable price. He and his partner have picked up plenty of tips on how to successfully organize a group trip over the past several years, since they both renounced their careers in the financial world. Foley was working in Manhattan at the time of 9/11; the devastation of that event moved him to quit his job and head out on an overseas backpacking trip that lasted for more than a year. Along the way he started a blog, which quickly grew from a friends-and-family audience to a reach of more than 20,000 followers. Kelly, a transplanted Englishman who lives north of Boston with his wife and three children, tracked his friend’s whereabouts online with more than a hint of envy. “It was almost like ‘Where’s Waldo?’ ” he recalls with a laugh. The two soon started an adventure club, offering guided tours that cater to what they see as an underserved market in the travel world. Young adults can join budget tours, they say; older folks can sign up for senior bus trips. But most of the travel offerings for people who fall somewhere in the middle are for families or couples, they say. “There’s really nothing for the huge, growing market of solo travelers,” says Kelly. Berryann, who is one of about 70,000 members of the Global Expeditions Club, has gone on several international trips with the club’s tour groups, which typically number around 12-15 globetrotters. The founders themselves have accompanied a few of those trips, including the one to Antarctica. “They both have very engaging personalities, and they both look out for me and the travelers in general,” she says. One of the keys to the trips they offer, say the founders, is their solution to the “single supplement” — the travel industry premium assessed to solo vacationers. Their trips offer a free roommate matching service; those who choose to pay the supplement can do so. Round-the-world tickets offered by air travel alliances such as Star, Oneworld, and SkyTeam have steadily gained in popularity in recent years, as increased competition leads to an easing of restrictions. But those deals require travelers to make their own hotel arrangements and negotiate all those foreign stops on their own. If you’re not one of the lucky few who can afford to shell out in the high five figures or more for a luxury round-the-world trip — Four Seasons Hotels, for instance, offers a five-star, round-the-world “Private Jet Experience” — then making like Phileas Fogg in Jules Verne’s “Around the World in Eighty Days” (or less) has likely always seemed undoable. Until now, as Foley and Kelly are banking. As Berryann decides whether she can take enough time off from her job as a medical software consultant to join GEC’s inaugural round-the-world trip next year, she applauds them for making it possible. “The more traveling you do, the more you want to do, is what it comes down to,” she says.